Today, we’ll take a comprehensive look at the subject of ‘nibbāna’ and, in order to allay the disagreement, try to build some understanding of this concept. To keep it brief we can limit ourselves to just two main points: the nibbāna that the ordinary individual knows, and that which they don’t. ‘Ordinary individual’ refers to everyday people with an everyday level of learning. Putting it bluntly, there’s the nibbāna that the ignorant know, and there’s the nibbāna that they don’t. The first kind, which everyday people know about, is the nibbāna which has almost no meaning at all and isn’t really the concern of the religion: in this country children are taught to use certain suitable words to describe death as it relates to animals and to the different social classes, such as ordinary people, those with some distinction, monks, royalty, and so on; and when it comes to the Buddha it’s taught that nibbāna is the proper word to use. This is the everyday understanding of nibbāna, that it means ‘death,’ the death of a Buddha. But, as the true Buddha can’t die then nibbāna can’t really be about death. Still, this is taught in Thai schools where the teachers, to inculcate the correct use of royal words, teach the children that nibbāna is death and is used to denote the death of a Buddha. This sort of thing’s repeated by those who don’t bother to study Dhamma but prefer to understand nibbāna as a place, a country, and that to reach this country it’s necessary to go through an enormous number of births and deaths first. Some of them even say that the country of nibbāna isn’t a ‘fun’ place, and because it doesn’t have anything about it that’s enjoyable then it’s not worth going to, and that they don’t want to go there anyway - and yet one has to wait for an excessively long time to get to it?! This is one kind of nibbāna, an example of the kind the ignorant know about. It represents wrong knowledge of a foolish kind. The second kind is the nibbāna the ignorant don’t know, the kind that we don’t have to wait an enormous number of lives for, that we don’t need to die to experience, the kind that’s always available, that sustains us, keeps us safe here and now. What is it? It’s the intermittent freedom from the kilesa, from the defilements - when the defilements don’t arise to disturb the mind, there’s nibbāna. If there’s defilement there’s heat, there’s fire, and should the fires of defilement burn day and night then people would go mad, or even die. But they don’t burn the mind day and night, they come and go, come and go, and that freedom from the heat of defilement is the nibbāna which sustains our lives here and now, allows us to live safely, to stay sane, to be free from nervous diseases and depression. So, get to know this nibbāna, the kind that there’s never much interest in, which is never much heard about - rather is it taught that only after another ten thousand, another hundred thousand lives can we hope to experience nibbāna. Now, we’ll need to be on our guard if we’re to know this sort of nibbāna: so, whenever the mind is cool and peaceful, free from the defilements, take a good look - it’s because we don’t bother to look that we don’t see, and we don’t look for it because we don’t think that it’s there in the first place, but, please, observe, take a good look and see how the mind is when it’s undefiled, when it’s free from the kilesa, how is it then? It will be cool, when the mind experiences anything and the defilements don’t invade, there’s coolness, the absence of heat, there’s nibbāna. Nibbāna appears whenever the mind doesn’t have the heat of defilement. This is something people aren’t ever aware of because they don’t look for it. But we should be aware that the defilements aren’t present all of the time, that the kilesa come and go, and when they aren’t around to burn the mind it dwells with nibbāna. So, when the mind is without the fire of the kilesa there’s nibbāna, but it’s a ‘little’ nibbāna, a temporary nibbāna, just a sample we can try. So, make a special effort, observe: when the mind is free of kilesa, how does it feel? Don’t follow those who say that mind is always defiled. We say that it can be free from the defilements. The Buddha said that these defilements are sankhāras, concocted, dependent on causes and conditions, hence they come and go, arise and cease, they aren’t always around - they arise, persist for a while, and then they quench away. Be aware when the kilesa have arisen, be aware of their presence, and be aware of their absence. When the kilesa quench from the mind pay close attention to how it feels, because it’s then that there isn’t the heat, the disturbance, there isn’t the greed, the hate, the delusion. How is the mind then? It will be cooled, cooled for a time because whatever came to contact it didn’t concoct the defilements into activity. We might say that it’s cooled by chance, or, that it’s been cooled by meeting with something that caused it to happen. For instance: let’s say that we go to the seaside, then perhaps experiencing the sea air might cause the mind to be without defilement, and because of that we’d feel contentment - it’s a quality of sea air, that it can cause people to feel contented, can cause the mind to be free from the kilesa for a time. On the other hand, perhaps we make samādhi, bring the characteristics of samādhi to ‘cover’ the mind, then the kilesa don’t arise and the mind’s cool, it tastes the flavour of nibbāna through the power of samādhi - any level of samādhi, it doesn’t matter which, if the mind has it, then it’s correspondingly free from the defilements and isn’t hot. Even vipassanā, a flash of insight that, just for a time, sees clearly into aniccaņ, dukkhaņ, and anaţţā, but doesn’t completely destroy the defilements, will bring the characteristics of nibbāna just the same. The frequent temporary experiences of nibbāna arising in dependence on created conditions are called tathanganibbāna; the temporary nibbāna that happens by chance is called sāmāyikanibbāna. The temporary nibbānas that come and go, come and go during our daily lives are, even though they don’t endure, still nibbāna. If they should endure then it would be true and absolute nibbāna, which, because it wouldn’t change in the normal sense, would be referred to as anupādisesanibbāna. Anupādisesanibbāna, true nibbāna, will be attained when the defilements are completely cut and an arahant arises into the world, but for someone still on the ordinary level of life, still an ordinary individual, there are the occasional nibbānas to sustain them - if there weren’t there could be insanity, or even death. Consider, for a moment, a tree: suppose we were to burn a tree a little but we were to pour water over it too; if we pour water over it often enough then the tree won’t die. In much the same way the defilements often ravage life, but the times when they don’t, when there’s no defilement, when there’s the occasional sort of nibbāna, are frequent enough to keep us reasonably sane and free from nervous diseases. We should be grateful for these temporary nibbānas, we, recognising the benefits, should be thankful for the nibbāna that sustains the mind and keeps us from insanity, even if it is only temporary. This is the nibbāna that the ignorant don’t know, the nibbāna that everyday people are unaware of. The word ‘nibbāna’ means ‘cool,’ it doesn’t mean ‘death,’ it doesn’t mean the death of a Buddha, the word means ‘cool,’ and has been used in that way since the first, since ancient times. In the Pali, or the Indian language ‘nibbāna’ meant ‘cool,’ and people would use the word to indicate coolness, something cooled. It would have been common useage around the house, for instance: someone might take the tongs and remove a glowing red coal from the stove, and, when the coal had become black and cool it would be said to be nibbāna. People nowadays will smile at this, but the word commonly used to describe anything which had once been hot but had since cooled down was ‘nibbāna.’ When boiled rice is nibbāna it can be comfortably eaten, while it can’t be if it’s still too hot, thus the Cook might call to those waiting outside: ‘Come and eat, the rice is nibbāna.’ If one were to say this now people would die laughing, but the word was, in former times, used in this way. Anything hot, once it had cooled down was called nibbāna. Thus the meaning of ‘nibbāna’ is ‘cool.’ The coolness of material things is called nibbāna, the coolness of the body, of the mind, of knowledge, of wisdom, of awareness is called nibbāna - even creatures, wild animals from the forest, once trained until they’re no longer dangerous, can be described as nibbāna. Observe, then, that nibbāna is something useful, something beneficial, not something useless. Nibbāna doesn’t mean dead, or vanished, take the literal meaning to be ‘cool,’ the coolness of something without heat. What’s a little interesting here is that people in Thailand, not in India as far as we know, but in Thailand, talk about a ‘nibbāna tree,’ by which they mean a dead tree - not one that’s been cut down, rather a tree that’s dead but still standing, so that the trunk can still be used. That tree, they say, is nibbāna. Ancient people probably knew the meaning of nibbāna better than we do now, hence they’d say that a tree was nibbāna – it was dead, but it’s heartwood was still useful, thus it wasn’t useless. Nibbāna isn’t useless; it’s beneficial. Understand nibbāna well, it means ‘cool,’ ‘cool’ and useful, because coolness brings happiness. If the mind is cool it’s comfortable, it’s without suffering, there’s no nervous disease, no insanity. We should be grateful for the coolness of nibbāna. Now, nibbāna has to be discovered in the saņsāra. Saņsāra is the opposite of nibbāna. The saņsāra is made up of kilesa, defilement, of kamma, the subsequent deliberated action, and of vipāka, the results of those actions - kilesa, kamma and vipāka. Confusion through the concocting of the kilesa into kamma and vipāka, that itself is suffering, spreading out as the saņsāra. So, in searching for nibbāna, it’s necessary to seek in the saņsāra, it’s necessary to look into suffering to see its quenching. If we want to watch a fire go out where do we look? We look at the fire itself. So, where will we find nibbāna, the quenching of suffering? We look at suffering to see it’s quenching, to see nibbāna. The quenching of suffering needs to be experienced right there and then, as it takes place, to believe that it will take many tens of thousands of lives for that to happen is wrong, to be genuine it has to be personally experienced in the moment that it happens, has to be sandiţţhiko, a personal matter, experienced by oneself there and then, as it occurs, there’s really no need to talk about any passage of lifetimes. Whenever there’s the quenching of suffering mind is cooled then and there, and that’s experienced by oneself then and there. Nibbāna is a sandiţţhiko matter that one sees for oneself; there’s no need to die and, after death, go through ten thousand, a hundred thousand lives to atttain it. We need to recognize that the defilements burning in the mind have been extinguished by whatever method, and that’s nibbāna: taţhanganibbāna, when something has been done to assist the process, or sāmāyikanibbāna, the nibbāna that simply happens now and again - either way it’s nibbāna. See nibbāna in the quenching of the defilements that blaze up and make the mind hot - as hot as hell - know this hell, know this is suffering, and, when the conditions for its quenching appear, the fires go out and it’s cool, then know this coolness too. This is nibbāna here and now. Wherever and whenever we’re able to practise for the quenching of suffering, whenever we’re able to control the defilements, there’s nibbāna right there. This is what we call ‘nibbāna here and now’ - the nibbāna that the ignorant don’t know about because they only know the nibbāna that needs hundreds of thousands of lives to attain, or the nibbāna that has to do with the death of a Buddha. To continue: nibbāna isn’t a matter of running away, of abandoning the world, neither does it cause a weakening of development. It’s often said that we need to leave home, to retreat from the world in order to attain nibbāna; it’s also said that if anyone has a nibbāna mind then they won’t develop, they’ll be unable to progress because being nibbāna they won’t want anything, won’t do anything, they’ll be passive, disinterested. But this is a wrong understanding. It’s not necessary to abandon the world. One can live in the midst of a fire without being burned by it – live in such a way that the defilements don’t burn the mind and right there is nibbāna. There’s no need to run away, to go and live somewhere else. Nibbāna is death before dying. Death before death? If this isn’t understood properly it just sounds insane, but let the ‘I,’ the ‘me,’ the defilements that are ‘me’ and ‘mine,’ let them die before the body breaks up and that’s ‘death before dying.’ The defilements that cause the feeling of ‘self’ die, so the ‘me’ dies and can’t arise again; it can’t because wisdom has arisen, so there’s proper understanding to prevent it, and, should it arise, it will dissolve away immediately. This is called ‘death before dying.’ Let the ‘me,’ the ‘self’ idea die before the body dies and there’ll be ease and comfort. If we cling to the ‘me’ idea then we have to bear life, to shoulder it, to cart it around, then life becomes ‘heavy’ - that’s suffering. Clinging to and carting something heavy around – the five aggregates - is suffering, throwing them off isn’t - then there’s no need to talk about death anymore because there isn’t anyone who’ll have to die. 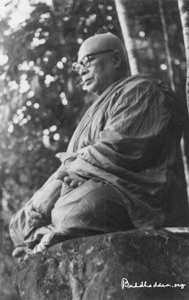 Living without the weight is cool and comfortable, one might want to call it ‘happy,’ but the true Dhamma says that it’s ‘not dukkha,’ it’s ‘dukkha-lessness’ here and now. We don’t need to suffer, cause the ‘self’ to die before the body does, and there won’t be any suffering. Then Māra can seek all he likes but he won’t find us, because the ‘me’ he’s seeking for will already be dead and gone. Now, it’s usually said that one ‘goes to’ nibbāna, but this is wrong, very wrong, because no-one ‘goes’ to nibbāna. Nibbāna is the quenching of the defilements right here; there’s no need for anyone to go anywhere, just quench the fire of defilement right here, coolness arises, and that’s nibbāna - right here and now. Hence, if we want to be correct we don’t talk about ‘going to’ nibbāna. If we insist on going to nibbāna we’ll never get there because, for one thing, we won’t know where to go. If, however, we just stay where we are and quench the defilements then we attain - we ‘arrive,’ and without having had to go anywhere at all. If anyone mis-hears this they’ll say that it’s more craziness, but be aware once again that the language used with nibbāna, with the lokuţţara is always the opposite of that used with the lokiya, the worldly. Hence we talk about the nibbāna that the ignorant know being of one sort, and that which they don’t being of another. If someone says that they can attain nibbāna without having to go anywhere it’s the most correct way of putting it. Now, it’s correct speech to talk about quenching the aggregates with the nibbānadhātu, with the nibbāna ‘element.’ The Buddha quenches the khandas, the aggregates with the parinibbānadhātu - full nibbāna, which he attains to at his enlightenment. When he awakens it’s said that he attains the anupādisesanibbānadhātu, meaning that he quenches the defilements, the kilesa with the anupādisesanibbānadhātu. That’s ‘death before dying,’ the complete death of the defilements, which ‘die’ before the death of the body. When, after many years, the time arrives for the body to break up then it won’t be the Buddha, it will be the body, or the five aggregates that do the dying. If ordinary people like us die it can’t be said to be a quenching with the anupādisesanibbānadhātu, it would be death with the kilesa: anyone still with defilement dies, or quenches the aggregates with defilement. If one were soţāpaņņa or sakidagami (the first two levels of ‘nobility’) it would be said that the aggregates had been quenched with the sa-upādisesanibānadhātu, hence, someone who’s arya, noble but not completely so quenches the aggregates in accordance with their level of nobility. The soţāpanna, the sakidāgāmi, the anāgāmi quench by way of the sa-upādisesanibbānadhātu, while the arahant, the Buddha, or the paccekabuddha quench via the an-upādisesanibbānadhātu. Don’t go too far and say that nibbāna is ‘achieved,’ or that the Buddha ‘nibbānas,’ that would be wrong. That which is called ‘Buddha’ cannot die, cannot nibbāna, only the kilesa can nibbāna: the kilesa, the defilements nibbāna, cool down completely and there is the anupādisesanibbānadhātu. Then, until the time arrives for the body, for the remaining ‘shell’ to die there’s quenching via the anupādisesanibbānadhātu. It’s said that the anupādisesanibbānadhātu is attained to by Buddhas and Arahants at the moment when the defilements cease completely, and as the Buddha ends the kilesas when he attains enlightenment then the full enlightenment of the Buddha is the pari-nibbāna of the kilesa, and the parinibbāna of the kilesa while still alive is known as anupādisesanibbānadhātu - until the end of life the aggregates will quench with the anupādisesanibbānadhātu. Hence, to say that the aggregates quench with the nibbānadhātu is correct, is right speech. Ordinarily it’s said that there is death with the nibbānadhātu, which is also right, after all the noble ones die, that is, the aggregates quench with the nibbānadhātu, whether sa-upadisesa or an-upadisesa. Worldly people, however, die with the kilesa, die with the defilements, because they’re still afraid of death, etc. Something commonly bandied around is that nibbāna is a crystal or jewelled city in some world up above. This is sometimes heard in Thai monastic discourses: ‘nibbāna is a jewelled city in the world above.’ This is a dangerous thing to say because it leads some to understand nibbāna as a place - rather in the way of another religion where they say that the world above – heaven - is the home of god. That nibbāna is a jewelled city somewhere in the sky is conjecture, it isn’t literal truth. Nibbāna isn’t a city or some world somewhere where no-one ever dies, rather nibbāna lies in the quenching of the defilements, so, to attain nibbāna achieve the quenching of the defilements, attain the undefiled state. If we call the undefiled state the city of nibbāna then, it could be said that, when the mind reaches that city it attains to nibbāna, but if we put it that way it will be misunderstood. Take care! If it’s supposed that nibbāna is some place or other it’s superstition. Nibbāna must be about the ending of the defilements: quench the defilements right there and nibbāna is right there – right there, but in the mind. Now, to say that nibbāna isn’t about dying in the physical sense, and that it has to be attained to before death happens is the proper way to state the case. Nibbāna is the quenching of the fires of defilement, it isn’t the death of a Buddha. Remember that Buddha’s don’t ‘die,’ they attain the ‘deathless,’ the amritadhamma, the amattadhamma. Don’t make the Buddha and the Arahants ‘die,’ that would be wrong. There’s no death other than the ‘death’ of the defilements. Nibbāna can be attained before the body breaks up, before death, while there’s still life. This is the most accurate way to put it. Another point is that nibbāna represents the ultimate freedom, the supreme ‘voidness,’ that is, it’s the quenching of the kilesa and thus ‘void,’ or free of mental heat, free of suffering, of ‘me’ and ‘mine’ so that those problems can’t arise again. When both the ‘me’ and the ‘mine’ are gone that’s ‘voidness,’ that’s freedom. Therefore it’s said that nibbāna is the ultimate voidness: there isn’t a ‘me,’ there isn’t a ‘mine,’ and there isn’t the anxiety and worry associated with them, that’s the supreme freedom. Remember paramatthavohāra, the language of ultimate truth, the mode of speech that conveys deep meaning, hence the saying ‘nibbāna is the supreme voidness’ doesn’t mean that nibbāna is a vacancy, a ‘supreme nothing,’ don’t understand it as void in the material sense, as being nothing at all, because, in the Dhamma sense, it means that everything is there that should be there, but there’s no ‘me’ and no ‘mine,’ there’s no defilement and no suffering. Now, another regularly discussed point concerns the conditions for nibbāna, that which is a condition for nibbāna, a condition for nibbāna being that which helps anyone to attain it. True nibbāna itself is ‘unconditioned’ and doesn’t require any supporting conditions. However, if anyone would develop the conditions for the attainment of nibbāna then they need to put an end to the defilements, so destroying the causes and conditions underlying the defilements is the same as creating the conditions for nibbāna - as it’s said, although it would really be a condition for someone to attain nibbāna. For instance: when we make a donation, when we make merit, if that activity were to become a condition for defilement then our merit-making would have to be motivated by the desire to be born in an elevated manner, into a paradise, or as a god, a goddess, or whatever. If, on the other hand, we make merit with the intention of making a complete end of the clinging to ‘me’ and ‘mine,’ of completely ending the defilements, then it would be the condition for the attainment of nibbāna. Anything that destroys the kilesa, everything one does that cuts the defilements is a condition for nibbāna. So get to know the conditions that promote nibbāna, make much of them and it will be more easily attained to. Now, don’t let the attainment of nibbāna lie too far in the future, don’t let it be a long time coming - ten thousand lives or whatever, one cannot wait that long. So, how, where, and when will nibbāna be attained? It’s when we behave properly that the defilements don’t arise, and that any in process of arising quench away, it’s right there and then that nibbāna is attained. When behaviour is correct towards phassa, sense contact, there’s nibbāna. We’ll mention ‘phassa’ again, in fact over and over again until it gets to be annoying, but it’s necessary that we do because the danger lies right there, right at the point of phassa, of ‘contact,’ when the eye, ear, nose, tongue, body and the mind meet with the sights, sounds, smells, tastes, touches, and mind objects and the appropriate consciousness, viññāna, arises to know about it. That’s ‘contact,’ phassa. This happens to everyone, everyday, and all of the time, because the senses do their duty all the time. When there’s sense contact and the mind’s ignorant then the contact will be ignorant and the defilements must arise. If, however, there’s wisdom, if there’s sufficiently developed mindfulness and clear understanding when any contact occurs it can be a correctly managed so that the defilements don’t arise, then there’s the coolness of nibbāna. To put it in a nutshell: act correctly in the moment of contact, of phassa, during the course of every day that we still have the eyes, ears, nose, tongue, body, and mind, and there and then, in that moment, the kilesa, the defilements won’t arise - the absence of the defilements is nibbāna. So, if one were to ask how and where is nibbāna attained? The answer would be ‘when there’s correct behaviour towards contact, phassa.’ This is the nibbāna that the ignorant don’t know about. They tend to understand nibbāna as being the death of a Buddha, or as a city somewhere, quite where no-one knows, but if we do a lot of merit-making we can go and live there - after tens of thousands, hundreds of thousands of lives spent making merit there’ll be nibbāna. That’s the nibbāna the ignorant know about. We’re disciples of the Buddha, of the one who knew, who was awake, and we, as followers of the Buddha, should be the same, we should know the nibbāna which is right and true and cease being foolish. Consider it as basic that if it’s to be the true Buddhist religion then it must include nibbāna. This is a general and fundamental principle that needs to be clearly and certainly understood: if it’s the Buddhist religion it must include nibbāna - just as, if someone is to be considered Buddhist they should know about nibbāna, if they don’t then they aren’t really Buddhist at all. If there’s no doctrine of nibbāna it isn’t the Buddhasāsanā, or if there is a form of nibbāna but it’s been culled from another ideology and isn’t understood in the same way, then it isn’t the Buddhist religion either. Nibbāna in the Buddhasāsanā, within the Buddhist religion, has the meaning of coolness, it’s coolness due to the absence of the heat referred to as defilement, kilesa. Put out the fire of the kilesa completely, destroy all of its fuel, and there is complete quenching of the heat. This is nibbāna in the Buddhasāsanā. If it’s not yet final nibbāna, if it’s only a temporary experience, then it can be likened to a sample of the merchandise, which is fine, because a sample of cake, for instance, is still cake, the only difference is that it’s a small piece. Thus, we get a little ‘taste’ of nibbāna whenever there’s freedom from the kilesa, whenever there’s the absence of greed, aversion, and delusion. What’s that coolness like? Taste it, and, if we find it agreeable, perhaps we can cause it to become complete, to endure. Nibbāna, coolness, appears when the defilements, the kilesa, are absent. Because this can happen whenever we meet with anything at the senses then nibbāna of this type is called taţhanganibbāna - temporary nibbāna - arising from anything, low or elevated. Because it comes only for a time before disappearing it’s called temporary nibbāna. However, if we’re clever enough we can prolong the experience, make it longer, make it last longer and longer until it’s full and complete. This is the nibbāna that the ignorant don’t know and which they need to know if they’re to overcome their ignorance. Buddhists cannot be ignorant of this subject, if they are they’re not really Buddhist at all. We can work out for ourselves what will come from wrong or right understanding of this matter, we can observe for ourselves that a proper understanding results in the absence of disagreement, of dispute, and that the result of that is coolness, coolness through the power of nibbāna. Think about it a little: we, at this time, are dukkha’s friends, birth, ageing, sickness, and death are our everyday companions, and, given that, how can we benefit from nibbāna, how can we, everyone of us, help each other to get benefit from it here and now. Well, we can cool ourselves down individually, and, through that, help to cool down our societies, and, perhaps, even cool down the whole world! That would be the greatest benefit, that would be to extract the greatest use from nibbāna: everybody, everyone cooled, the whole world cooled, cooled on the level where we keep the defilements under control, or cooled on the level where they’re truly finished with. Have a little of nibbāna while living in this world and in the condition we’re in. Strive to meet with the undefiled, to keep the kilesa from arising as often as is possible, try to dwell with a mind free from defilement. Make the effort to study. Seek the opportunity of associating with people who live restraining the defilements and join with them wherever they are, dwell trying to prevent the arising of the kilesa, do that as well as we can and we’ll have the corresponding coolness. Cultivate the desire for a cool rather than a hot life, and life will become cooled. It’s a certainty that life can be cooled: act wrongly and it’s hot, behave properly and it’s cool - life can be cooled, just be one of those people who live carefully, who pick their way carefully through life. There’s this wrong comprehension amongst Buddhists where the matter of nibbāna is concerned, and so there’s abuse, condemnation, insult, disparagement: ‘they’re wrong, I’m right!,’ and so on. There’s disagreement over the matter of coolness itself, which tends to make the cool into the hot. We think this is something that Buddhists ought to understand properly, then the wrong opinions can fade away and we can come to a correct understanding.